India’s leading car manufacturer, Maruti Suzuki is going to introduce a new compact crossover for the coming festive season. To be named as “Maruti Ignis” , the compact crossover will be exclusively made available only in Nexa showrooms. The Ignis will be 3rd product under NEXA brand and is all set to surprise the car lover coming Dasara/Diwali. The upcoming Maruti Ignis will be strategically placed under the Baleno segment. The Maruti Ignis will take on the rivals like Mahindra KUV100. Exclusively available at Nexa showrooms, Ignis will be slightly premium when compared to other Maruti products. 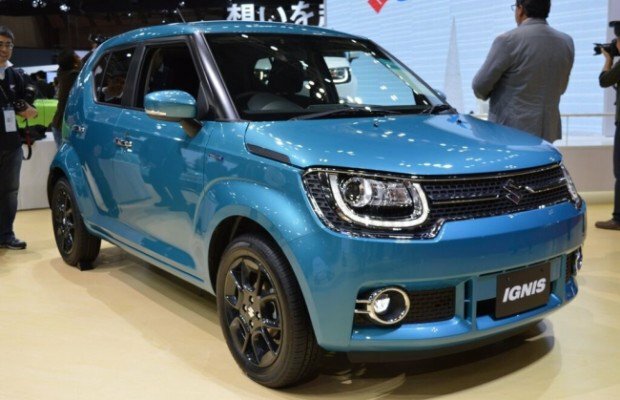 Sources have confirmed that the Maruti Ignis is going to be powered by both petrol as well as diesel engine options. The Maruti Ignis diesel will be powered by 1.3 litre DDiS, 4-cylinder diesel engine that is capable of churning out 75 HP of power where as the Ignis petrol version gets a reworked 1.2 litre, K-series engine. Maruti Ignis will be getting a CVT automatic gearbox, and not AMT (Automated manual transmission). Some of the features of Maruti Ignis include tablet-like touchscreen infotainment system, retro AC controls, new steering wheel, the car also gets ample space with an efficient layout design. Maruti Ignis was first introduced at Auto Expo 2016 in the month of February.